We coating our garage floor yesterday with the Rustoleum epoxy. It turned out nice; however, we have areas that need more coverage. Is it too late to apply another coat. We had some blistering too here and there. What are our options? Hi Janel. Rust-Oleum has a 76 hour recoat window to apply another coat without any further prep. We recommend that you sand out the blistered areas before the second coat is applied. Is the rock solid garage coating a better system than the rustoleum professional epoxyshield? Looks like professional has 4-5mil and rock solid has 3 mil and do I need to put clear coat anyone of these for residential use in a place with snow? Hi Prem. We would choose the Rust-Oleum Professional over RockSolid for a one coat system. It goes down thicker and has much less complaints regarding cosmetic looks due to coverage issues. We do recommend a clear coat if you live in a region with snow. An anti-slip additive is a good idea as well. Our first recommendation, however, would be a single-part polyurea coating. These are the best coatings available for those looking at the easy to apply DIY products. They have many more benefits over EpoxyShield, RockSolid, and other similar DIY coating products. I just coated my floors yesterday with Rustoleum Epoxy Shield for a 2.5 car garage. The coverage states up to 500 sq ft. After I started coating the floors, I realize I will be short. I had to purchase a 1 car garage kit, the same color and brand, to complete the project. I sprinkled the optional decorative paint chips per the instructions. Well, the additional 1 car kit I bought, the color is a lot darker then than the 2.5 car kit. At this point, I guess my options are to live with the color differences or recoat the floor (2nd layer). My questions is, do I have to remove those decorative paint chips if I decide to recoat the garage floor? Hi JT. You don’t need to do anything with the color flakes. You would just coat over them and apply new flakes with the new coating. The new coating will completely cover them, but you may still see the irregularities or bumps from them under the coating. Applying a few more color flakes than previously helps to disguise it. Remember that Rust-Oleum has a 72 hour recoat window. If you wait longer than that you will need to degloss the current coating by roughing it up with 120 grit sandpaper first. 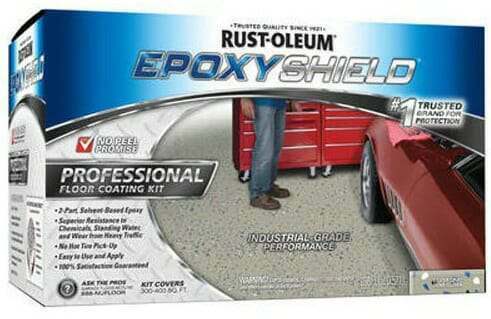 Question… we did the Rust-Oleum epoxy garage kit yesterday. It has not finished drying yet but seems to have a rainbow affect. You can tell where we did each section because it seems to be either a shade darker or lighter than the previous section. Will this go away as it dries? Yes, it should go away as it dries, Katie. If you had any length of time between sections this is normal. If it doesn’t go away after it cures, we recommend contacting Rust-Oleum and tell them what happened. No it doesn’t. We just re-did our garage floor because of the different colors when it dried. The paint for the second application was sent directly from Rust-oleum. It too is drying in two different colors. Hi Gale. What we can tell you is this. Anytime that you need to use more than one batch or kit from any manufacturer in order to apply one coat to a garage floor, all of the part-A colored resin containers from each kit should be poured into one clean bucket and mixed together. This will ensure color uniformity. When you are ready to start the application process, pour the part-B from ONE kit into a clean bucket and then the appropriate amount of the pre-mixed part-A colored resin and mix according to instructions. When done in this fashion, each application that overlaps the next will be the exact color. That’s what we were told by the company representative and that’s exactly what we did. My husband followed the instruction faithfully. In addition to the color variance (tan and pink), the paint pushed away from some of the chips leaving a fish-eye. The garage floor was poured about three months ago and the garage has always been empty. At this point, we are going to have to sand it off, and hire a professional company. We paid $400.00 for the product and are terribly disappointed. I have read that customers expect too much from the product which I think is a terrible statement. I think most people should be able to expect a product very similar to what’s pictured on the box. Perhaps Rustoluem has gone the way of many companies these days and no longer cares about producing a superior product, or maybe it’s the fact that we bought the home version vs. the industrial version. I don’t know. The second try did come out better, but still has color variation and fish-eyed chips. Lesson learned I guess. Are there any patch kits as I prepped my floors for two days and used murattic along with the citric tgst cones with kit and have a spot under 1 tire tgst us peeling 2 months in- what options are out there rather than revolting entire floor and cleat coating again? Hello Bill. Patching can be tricky depending on what product you used, whether there are multiple coats, clear coats, color flakes and etc. If it was a typical garage floor kit that you can purchase from a home improvement center or similar, then no, they don’t have patch kits. If you purchased a commercial product from a floor coating vendor, then we suggest contacting them. These type of vendors sometimes offer such kits. I have a three car garage that is about 650sq ft. I am thinking am going with your recommendation for the Rust-Oleum professional epoxy shield but after calculating it… its not much more for a professional to come out and do it. For 2 coats i would be spending close to $1000 for me to do it and $2000 for a professional to do it. is that sound about right and is it worht the difference. i am willing to spend the extra money if the overall product is worth it. Hello Carl. We aren’t sure where you are getting your pricing. It would require two 2-gallon kits to cover your floor for one coat at an approximate price of $250. Two coats would be $500-$550. A professionally installed garage floor coating would definitely be more durable, but prices start in the neighborhood of $3.50 – $4 per square foot and go up from there. A garage your size should cost a minimum of $2300 depending on the area you live and the product used. Do not get pricing from general painters or handymen. We suggest you read this article here about how to choose a floor coating contractor. I painted my garage floor with a 2 part epoxy paint & when it rains or moisture is outside the is very wet. Everything that on top of the floor get very wet,( tools chest,& vehicle).need to know how to fix this problem. Hello Darrell. It sounds like you have a condensation problem in your garage. It has nothing to do with the floor if everything else is getting wet as well. Relatively warm moist air is coming in contact with relatively cool objects in your garage. The warm moist air cools when it comes in contact with the object and is no longer able to retain the moisture since cool air gets more dense. It releases the moisture onto the object it comes in contact with. This is generally a seasonal issue for different parts of the country. Keeping your garage closed helps. So does running a dehumidifier. Another option is to heat the garage. 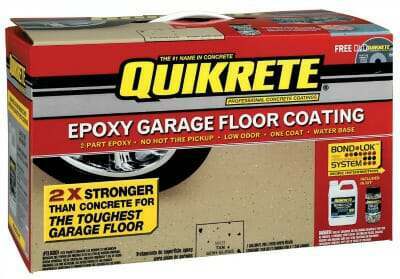 Can I use rock solid over an already epoxy coated garage floor. Yes you can, Walter. It will require roughing up the current surface with 120 grit sandpaper first. Would you recommend 2 coats of the rust olem waterbase or one coat of rock solid? $200 for 2 coats vs $ 179 for one of rock solid. Hello Brad. RockSolid is the better product of the two choices. It does much better against hot tire lift vs the water based EpoxyShield. You may want to price Rust-Oleum Professional EpoxyShield as well. It’s a solvent based epoxy and performs very well for the price. It’s on par with RockSolid in terms of durability. Our basement floor was painted years ago by the previous owner. Can this product be applied to an already painted floor? If so, are there any extra steps we should take first? Hi Jessica. Yes, you can apply the water-based epoxy kits to a floor that has already been painted providing that the current paint is adhered well and not peeling. We wouldn’t advise doing this for a garage floor, but since the basement only gets foot traffic then you should be fine. The current paint should be cleaned and then roughed up with 120 grit sandpaper. You can use a pole sander to do this. A quicker and less laborious way would be to rent a floor maintainer with a black scrub pad. It will do the same job and be much faster. Just be sure to vacuum up the all the paint dust before applying the epoxy. How do you clean the floor. My garage was painted with rock solid product and now shows tire marks and looks unsightly. Hi Susan. 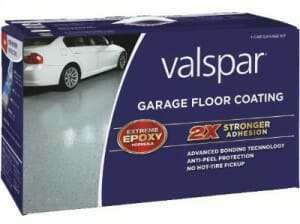 We have an article about cleaning garage floor coatings here. I applied Rust-oleum epoxy shield to my basement floor. While drying the paint has started to bubble, any idea why? I did prepare the floor with a gripper white primer and sealer beforehand. Hello Rose. What is the exact name of the EpoxyShield product that you used? I applied the Rust-Oleum 2 part epoxy system to my 2 car garage 3 years ago. I now have bare concrete pock marks where the middle of the cars sit. We get alot of winter road salt in Iowa that tracks in with our cars. Not sure if degrades epoxy? Do I have to strip down current surface, and repeat the whole process again, or can I recoat? Hello Brad. You can rough up the current coating with 120 grit sandpaper and then recoat. We would suggest etching the bare concrete with the etching pack that comes with the kit. Keep in mind that you will have the same problem again in 2 or 3 years. If you want something that will last, we suggest grinding the current coating off and apply a much higher quality product. The newer single-part polyurea coatings are of commercial quality and just as easy to apply as the store bought DIY kits. Hi Larry. Epoxy actually cures – it does not dry like paint. If sections are still tacky after three days it’s an indication in most cases of improper or poor mixing. The part-B hardener is a catalyst that needs to thoroughly mix with the part-A resin. If it doesn’t, you can have sections of resin that remain tacky because it has not been able to complete the chemical reaction that causes it cure and harden. There is an induction period that is required with most DIY epoxy kits that require you wait a specified amount of time after mixing based on current temperatures. If you don’t do that the two components will not compatibilize with each other and can cause curing issues and sometimes appearance issues. Sometimes with these type of kits an application of another coat will activate the still tacky material enough to finish curing. We recommend calling the manufacturer to discuss this. You only have a small window of days to recoat without having to prep the surface. The only other option is to wait it out a few more days to see if it will finish curing. That’s correct, Chris. All epoxy (not just Rust-Oleum) will amber when exposed to direct U.V. light. That is why a polyurea DIY coating or a full color flake floor with a polyurea or polyurethane clear coat would be a better choice if that is an issue. Polyurethane and polyurea are U.V. stable and will not amber (yellow tint) when exposed to direct sunlight. Going to use rust oleum;then top coat with clear coat. no one ever mentions what brand of primer to use and does the rust oleum adhere to all primers. Hello Orlando. 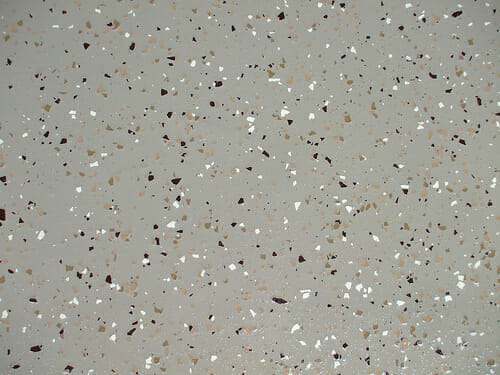 The Rust-Oleum epoxy is a low solids content epoxy (lower than most epoxy primers) and therefore does not require one. Also, don’t confuse latex concrete paint primer as a primer for epoxy as it will create a mess to fix. This article here about epoxy primer will explain. just built a kennel with concrete blocks and was wanted to epoxy the walls. Will this apply to walls also with not a lot of running and which would you recommend for this as dogs and puppies will scratch and paw and I would like it to look nice for a while with out having to redo every few years. Hi Jeff. Providing the kennel is not outside, it can be applied, but it has to go on thin to prevent running and it would require multiple coats. You would need to mix it up in small batches to do so. You may be better off with a regular concrete paint and just repaint it once in a while. I have used the Rustoleum Garage kit. It has worked great, on concrete that was probably 40 years old when applied. I must say I think much of your success depends on PREPARATION. I acid etched 3 times. I degreased at least 4 times where needed and pressure washed at least 3 times after acid etching and degreasing. You must make sure the concrete absorbs water and it doesn’t sit on the surface. I had a few areas which seemed to almost have a clear sealer on them, and I had to get this off. I have had it down for about 7 years, no peeling, flaking or tire marks.Still looks new. Hey rob, reading the instruction on preparing the floor. It says do not use muriatic acid. Any reason why not? Hello Lance. If it’s RockSolid polycuramine or Rust-Oleum polycuramine, they don’t recommend acid etching and would rather have you use the citric acid etch provided in the kits instead. The reason is that the polycuramine goes on thin to begin with and the coverage rates always fall short of what is stated on the box. Combine that with the much better profile that muriatic acid provides, you get more of the coating absorbed for a great mechanical bond. The problem with that, however, is that you get cosmetic issues from the thin application with only one coat and people complain. You talk about Rustleum recommending to only use the citric acid pouch in their garage kit. I used this and followed directions. I felt it did next to nothing to create a profile for the product to adhere to. I then used a Rust-Oleum phosphoric etch 2x) which gave me a decent feeling profile. I have one kit for 2.5 car garage. Reading your comment that a rougher profile the product won’t give me the coverage I need. I am a first time DYI guy on this project. Do you recommend me buying a second kit and doing a second coat 24-48 hours later? Or do you think I should buy that second kit and try to apply it thicker? Obviously I would wait to throw out the chips until the second coat is put on if that is an option. Hello Lane. Which product did you get exactly? Rust-Oleum makes a few different kits. Shea, I have the epoxy shield 2 1/2 car garage kit. Hi Lane. OK, that does make a difference. 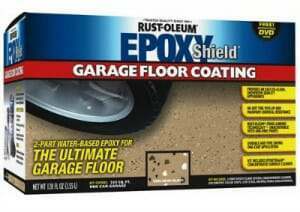 It’s the Rust-Oleum Polyurcuramine and RockSolid Polycuramine garage floor coating kits that are having the coverage issues with a more aggressive profile. You have the standard water-based epoxy kit which hasn’t had that kind of problems that polycuramine has had in terms of coverage rates and thickness. You should be OK providing that your square footage is less than 500 square feet. You’re welcome Lane. You should be able to cover that without issue unless some areas of the concrete are much more porous than others. Let us know! This turned out great. One last question! As stated I used the epoxy shield 2 1/2 garage floor kit with the paint chips. I am wondering if I can apply the epoxy shield premium series Clear Finish for some added shine and protection? Will this product cover the paint chips? I almost forgot. I did run short on product. The 2 1/2 kit just didn’t quite do it. I had one 10×10 slab remaining ran to get a single car garage kit which did the job with a bit left over. The color matched perfectly but I found the single kit to be much, much more runny than the other kit. Not sure why but it worked out! Glad to hear it turned out great for you, Lane. Yes, applying the EpoxyShield Premium Clear will lock in the color chips, add a little more gloss for a richer look, and do a better job of protecting the floor. Rust-Oleum generally allows for up to 48 hours to recoat without additional prep. 1 car attached garage, the cement is 20 + years old and and was just properly cleaned/ power washed 2 weeks before I etched and washed. I then used a dehumidifier and waited 1 week before I applied Rust-oleum EpoxyShield regular gray gloss from Lowes. Temperature was approximately 70 degrees with low humidity and no rain when I put down the epoxy on 09/29/18, and used the flakes at the same time. I did 1 coat which looks pretty good now but has small variations in thickness and gloss. after waiting till today, 10/1/18, with Temperature approximately 70 degrees with low humidity and no rain, I put down a coat of clear Epoxyshield topcoat but I have variations in shininess and smoothness so far. My questions are: Does this variation blend or smooth over looking better after dried? Also is there a possibility that a second coat of Clear Epoxyshield top coat will fix these issues? Hello Jay. The clear coat will not fix the variations in gloss that you encountered with the color coat if that is what you were hoping to accomplish. Generally when gloss levels are decreased in a color coat it’s because the coating was not thick enough in those areas to begin with. This can be due to porosity differences in the concrete when only applying one color coat or from stretching the coverage rate and spreading it too thin. A second coat of clear will help to make the surface more smooth if that is your goal, but it won’t necessarily fix gloss issues. Since you applied the clear more than three days after the color coat, we are assuming that you properly roughed up the surface of the color coat before you applied it? I have a garage floor that has been painted with an oil based stain. It is adhered to very well> What should I use? Hello Steve. When you state that the stain is oil based, is it an actual stain that permanently changed the color of the concrete or is it a film forming coating that is called a stain? Do you have the exact name of the product? Hi, I bought the rustoleum rocksolid garage floor coating kit and after reading some commenst am starting to think i made the wrong choice. I undertsand the prep work involved but noticed the kit does not come with a primer or top coat so do I not need to apply a primer since my concrete floor has never been painted or sealed (just etching it will be sufficient) ? Also would coverage be an issue with this kit (standard double garage). And is it worth top coating or no need. Hello Con. The RockSolid garage floor kit, along with other home improvement store type of epoxy paint kits, are designed as a simple one coat application. You would need to purchase their clear coat separately. All of these kits are thin residential quality coatings and are not the thick commercial type coatings that you can purchase from actual concrete coating vendors online. 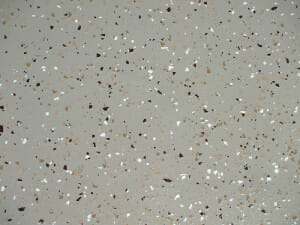 Due to the thin coating and/or low solids contents, an epoxy primer is not required. Adding a clear coat protects the color coat and adds to the durability of a coating. RockSolid is known for having exaggerated coverage rates. The 2.5 car garage floor kit states a coverage rate of up to 500 square feet. We have found that you need to reduce the stated coverage rates by 10-15 percent depending on the porosity of your concrete. The RockSolid polycuramine adheres very well, but the biggest complaint is color uniformity between kits and patchy matte looking finishes from the the coating going on too thin. Sometimes it has required a second color coat to provide a consistent color and gloss. How would you suggest to repair cracks before applying product? Hi Chris. We have an article right here that explains how to fix cracks and what materials to use. I have a 500sq ft garage and plan to use the standard epoxyshield 2.5 car garage with a single car kit. Once coated, I would like to use Sherwin Williams armorseal rexthane to clear the floor (had good past experience with it over h&c epoxy). 1. Can/should I mix both epoxyshield kits together to ensure the color matches? 2. Is a single+2.5 car kit enough for 500 SQ ft? 4. Will armorseal rexthane work with epoxyshield? Hello Cody. Do not mix more than one part-A and part-B component in a kit together at once. If you mix any more than that, the epoxy will experience a much larger exothermic reaction that will create a lot of heat and significantly shorten the pot life. That is why the 2.5 car package has two separate mixing kits. Instead, what you should do is mix all the part-A colored resin components together first in a single bucket. Pay attention to how many ounces each part-A unit contains. In a clean separate bucket, pour in one container of the part-B hardener and then the appropriate volume in ounces of the premixed part-A colored resin. You can purchase cheap measuring containers from the paint dept of your local home improvement center. If you mix each kit into a clean container in this manner, it will ensure the color uniformity you are looking for. Just make sure to maintain a wet edge during the application process. One 2.5 car kit covers 450-500 square feet. This is not enough for a single coat to cover 500 square feet. Once you factor in material loss in the mixing container and what the concrete absorbs, you will come up short. You will need a single car kit to go with the 2.5 car kit for a total of 3 separate batches that will need to be mixed. Just divide your garage into three equal areas. Contain each mixed kit for application within each area and you will get good coverage. We recommend a muriatic or phosphoric acid etch as it will provide a better prepared surface for the epoxy to bond to. The citric acid etch packs that come with the kits do not work as well and can result in issues with peeling or hot tire lift if you have harder than usual concrete or a smooth troweled floor. Yes, Armorseal Rexthane will work with EpoxyShield. Just make sure you apply it within 24 hours of the epoxy being applied.